This old fashioned favorite has inch-long, heart-shaped flowers that suspend from arching stems. Blooms can be sweet pink or a delicate white. It tolerates heavy shade, is one of the first spring bloomers and looks great in a woodland garden. Lush plumes of flowers shoot above fern-like foliage in a wide range of dazzling colors including pink, lavender, red, white and salmon. Astilbe is one of the most common perennials for shade, working well in borders, along paths or for a pop of color at the back of shady areas. It can also be quite striking in containers. 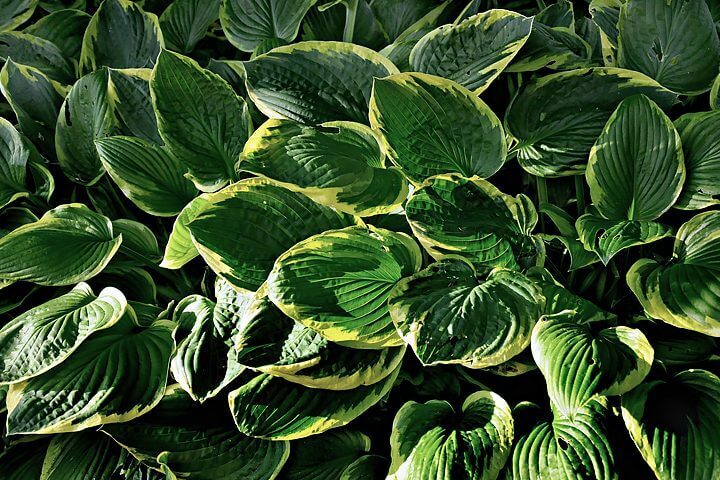 These opulent shade perennials are chosen for their stunning leaves. They come in a multitude of shapes, textures and colors, ranging from cool blue-green to vibrant chartreuse. Some varieties can become quite large growing to be a several feet in diameter while others produce tiny leaves that add a gentle touch to shady areas. Typically called monkey grass, liriope will tolerate full sun to light shade making it one of the most versatile choices for any garden. It will develop 12-18” tall clumps of slender leaves and produces shoots of violet flowers in late summer. Liriope makes a terrific option for borders. Officially known as hellebore, this is one of the most stunning perennial flowers for a shady area. Its shape is a clump of dark green leaves that produces large, unique cup-shaped blooms in white, pink and a lovely rosy purple. Columbine has wildly exotic flowers that cover the full color spectrum. It will do well in full sun or full shade, and prefers moist, well-drained soil. The perennial is known to self-seed, so be sure to deadhead if you want to control the spread. There seems to be endless variations in leaf color for the heuchera: silvery, burgundy, purple-black, chartreuse, salmon and rusty orange. With this shade lover it’s the foliage that provides the visual enjoyment, though some varieties also have feathery flowers that shoot out from tall stems. Many foxgloves are biennials, which means they spend their first year growing foliage, their second year flowering and then they die. This may sound bothersome, but the plants usually reseed so you wind up having flowers every year. And the result is a spectacular showy bloom that is like no other in shady areas. This common groundcover has smooth leaves and tubular, purple flowers that pop up early in the spring garden. It spreads by creeping on the ground, putting out roots as it goes. Plant it with your perennial shade plants and it will help to prevent weed growth. Dead nettle is prized in the shade garden for the silver green foliage that makes an excellent groundcover. But it’s not only a lovely foliage plant; it is also popular for the flowers look like snapdragons and bloom in May/June. This shade lover brings a touch of elegance to your garden. Fuchsia produces dazzling pendulous flowers, making them perfect for hanging baskets. The petal-filled blooms appear in a number of shades of red, pink, and purple. Bonus — hummingbirds love fuchsia. Sometimes called wishbone flower, torenia is a charming garden shade plant with beautiful trumpet-shape blooms in a range of shades from blues and purples to pinks and yellows. Versatile torenia is also available in both upright and trailing varieties, making it perfect for beds and borders as well as containers. Impatiens is arguably the most popular plant for shady areas. They bloom constantly from spring to fall, offer flowers in just about every color, and are virtually maintenance free. Impatiens will really brighten your garden or container. This shade annual is known for its fanciful foliage—there are hundreds of varieties, and they feature leaves splashed, spotted, streaked, and otherwise colored with shades of chartreuse, purple, pink, red, black, and green. You can mix-and-match a few varieties of coleus together for great results or use them to complement your favorite flowers. Often mistaken for coleus the perilla features fabulous foliage, though in a more limited range of colors. Varieties such as ‘Magilla’ offer variegated leaves and can grow to be over two feet tall making it your perfect “thriller” in a container. Browallia is a less well-known pick for adding rich color to shade areas. This charming annual bears star-shape flowers in blue, lavender, and white over emerald-green foliage. It’s a fast grower that does well in shade or sun. In warm-climate areas it may self-seed, but is not invasive. For a nearly carefree shrub you should consider this reliable hydrangea. Its leaves change from bright green in summer to stunning red, purple, burgundy and bronze in fall, and its white flowers take on a pinkish tinge as they mature. These shrubs will thrive in morning sun with afternoon shade (especially in hot climates) or in full shade. This deciduous shrub grows 3 to 4 feet high and spreads 4 to 6 feet across. Fragrant, tiny white flowers appear in May and June, held on lovely drooping stems. Sweetspire is easy to grow and tolerates many growing conditions, including heavy shade, clay and wet soils. These needled evergreens are valued for their showy red berries and as a variety of shrub that does well in shade. Some people find them boring or overused, but the versatility of these tough bushes makes their case for them. Common plants are common for a reason – they perform well and look good. You will prize the beautiful spring blooms in many brilliant shades that are produced on this shrub. Rhododendron come as both evergreen and deciduous varieties and can grow in many different USDA Zones. They like acidic soil and do best in partial shade, although some varieties will tolerate full shade. Well, don’t you agree now? These are a lot of terrific suggestions for beautiful plants for shady areas. As you begin your spring planning the hard part will be making a choice of which you will be including in your garden. Take your time, do your research and be confident that whatever you choose will perform well for you.